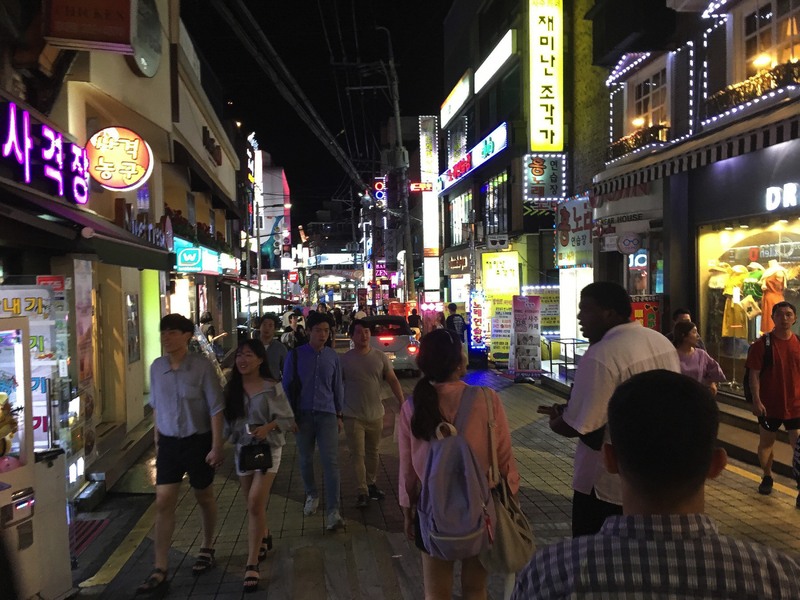 Back in April, shortly after I accepted an offer to teach English in South Korea for the academic year ahead, I started getting questions from concerned friends and family. “Are you worried?” They meant, Are you worried about North Korea? Every time tensions with the North flare up, American journalists are fond of spelling out the dire consequences that would result from open war on the Korean peninsula. The North probably couldn’t win, but in the process of losing, it could devastate the South, whose capital lies just 35 miles from the border; at least a hundred thousand civilians (possibly millions) would likely be killed, to say nothing of military casualties. Headlines in April were already grim: North Korea had tested a ballistic missile, prompting the people currently in charge of the American government’s executive branch to rattle their sabers. Things have only gotten worse since then: North Korea’s successful missile tests over the past two months have increased in range, prompting Donald Trump to bloviate about unleashing “fire and fury” in retaliation; North Korea then threatened Guam, a strategically important American territory. A lot of Americans imagine that North Korea’s nuclear belligerence must be even bigger news in South Korea, which is directly in the line of fire. They might be surprised to find that, at least to judge from newspaper headlines, the threat of a nuclear civil war is competing for attention with an egg-contamination scare and car taxes. (The English versions of the same newspapers give the North top billing.) As I write this, the new South Korean president, Moon Jae-in, is holding a press conference to mark his first hundred days in office; he says flatly, “There will be no second war on the Korean Peninsula.” Journalists squeeze in a few questions on “the North Korea problem,” but it’s one concern among many—and for one reporter from the television network MBC, America’s current unpredictability seems as much a concern as North Korea’s military technology. Why does the degree of Americans’ and South Koreans’ concerns feel so different? Some articles and essays, before the election in the New York Times and more recently in the Guardian and on the website Vox, have covered the main reasons: South Korea has had to deal with North Korean threats for more than six decades, during which a lot of fear has sublimated into indifference, at least superficially. Economic concerns feel more pressing, especially to younger voters. And in the wake of the impeachment (for corruption) of former South Korean president Park Geun-hye, political ethics have also taken center stage. Americans, for their part, are not used to being within striking distance of a hostile nation’s weapons (other than Russia’s). I think there are also a lot of American fears that the Cold War equilibrium of “mutually assured destruction” doesn’t apply when nuclear arsenals are being wielded by Kim Jong-un and Donald Trump. A friend shared a cartoon the other day; in it, North Korea is shouting about war, the United States is freaking out, but South Korea, represented by two smiling women in a shop, calmly wonders, “Do those come in red?” I’m Korean-American, and, having been adopted at a young age, grew up entirely in America, so my assessments of differences in cultural outlook are purely an outsider’s. Still, to me the joke captures something true not only about the countries’ respective attitudes, but also South Korea’s lovely, hard-earned joie de vivre. The culture of contemporary Korea as I have come to know it adores cuteness, French-style pastries, flowers, natural-toned interior design, handicrafts, sentimental TV shows, and bubblegum pop; although it maintains the world’s seventh-largest standing army out of necessity, compels universal male conscription, and is still technically at war, it’s hard to imagine a society that revels more fully in the delights of peacetime. For months, I’ve been trying to reassure my parents and other family members and friends that everything will be fine. I point out that there are easily a dozen other places on the planet that are more dangerous than South Korea at the moment. Indeed, perhaps I’m even safer here: a person is seven times more likely to be violently murdered in the United States than in South Korea, where civilians other than sport hunters generally can’t own guns. A nuclear hot war with North Korea is an instance of what the psychologists Amos Tversky and Daniel Kahneman called an “availability bias”: a calamitous but extremely low-probability event that attracts a disproportionate amount of attention, thus leading people to overestimate the risk of its happening. I tell people all this, explaining that at the first hint of serious trouble, the State Department will almost certainly tell us all to leave immediately. But the truth is that I am also trying to reassure myself. When I visited South Korea while Barack Obama was in office, I felt fine. Now, though, it’s hard not to feel like a presidential stomachache, or a bad day on the links, could do us all in. The town where I teach lies within five or six miles of the Demilitarized Zone; if shells start falling, we get hit first. I just don’t want to perish in flames because Donald Trump sends out the wrong 140 characters. What pains me most when I hear the current White House talking blithely about unleashing “fire and fury” is the realization that all of the beautiful civilian tranquility of the South would be destroyed within days as Pyongyang retaliates—like a flower caught between two howitzers. Over the past couple of years, I’ve been trying to learn all I can about how both Koreas got here: the Japanese Empire, Korean communism, civil war, Cold War, military dictatorships, famines, democratic transitions, and everything in between. But there’s precious little it feels like I or any Korean-American visitor can do, even with all the historical knowledge in the world. The course of history has wound to this point, where so much responsibility has fallen into the hands of two narcissists. I feel a bit like Stephen Dedalus in Ulysses, watching a continent swerve ever closer to war, helplessly worrying that history is a nightmare from which I’m trying to awake. Meanwhile, like him, I’m just here, teaching school. Spencer Lenfield ’12, a former Berta Greenwald Ledecky Undergraduate Fellow and Rhodes Scholar, is teaching English in South Korea this year.